Many of us have been caught in this situation: We’re on a business trip or vacation, and some crystal-clear trout stream meanders into view. We might even have gear handy or know where to borrow some. 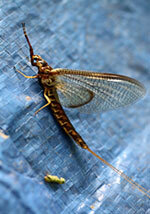 But we don’t have any idea what bugs might be the preferred meal for local trout. This week Phil Monahan offers a few suggestions for how to begin fly selection on “trouty” but unfamiliar water.